1. What kind of bike do you ride? Is there a story behind that? I ride a canary yellow 1960’s Schwinn that belonged to my grandmother, Marianne. In partial tribute, the bike’s name is Mavis, and though a bit rusty and vocal in her comings and goings, she’s a real sweetheart. 2. When did you start riding? I have fond memories of learning to ride without training wheels on the front lawn of my grandparents lakeside home in Gainseville, Georgia when I was just eight years old. After years of neighborhood riding, my activity had quite a lapse, but I’ve been back on the saddle consistently since the spring of this year. 3. How often and where do you ride? 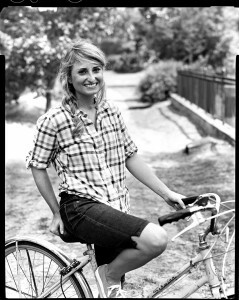 Since ole Mavis is just a 3-gear bike, she works best on flatter terrain such as the beach, Oak Mountain’s main road or the Lakeshore Trail. She’s quite a sport on the trek to Pepper Place on Saturday mornings. Since I prefer to ride with friends, I typically ride once every week or so. 4. What is your favorite aspect of riding in Birmingham? The fact that I can ride downtown and not fear my life. I guess there are pros and cons to living so close to an urban area that turns desolate in the evenings and weekends. While I do wish there was more activity down there, it’s nice to be able to have the wide open road practically to myself. 5. What are the things you would like to change about riding in Bham? Can we take out some of the hills? Particularly the one leading up to my house? 6. Any particularly awesome story? I recently discovered the vast awesomeness of ZaZa’s trattoria, which is just a quick ride from my house. When combined with their weekend brunch and the company of a good friend, the trip there makes for a sweet ride. 7. Why do you ride? I do my best thinking on wheels. Riding provides good time to slow down and look and listen. It sure as heck beats getting in the car, especially when I’m just headed somewhere close.. Check her out…she is super talented, yall. And quite possibly the cutest, sweetest Barista/writer/crafter EVER. That’s a great B&W photo. The plaid shirt and long shorts go so nicely with the vintage Scwinn – such a classic shot that it’s hard to tell what decade it is.